In cooperation with HH Lang Na Rimpoche, Wildlife Dept. and Nomadic Resort in Korzok, the Amitabha Expert introduced an awareness campaign for a clean Environment to the Tso Moriri Area, one of the main tourist attraction in the Chantang plateau with almost 120.000 visitors per year. Places of activity were Puga school, Sumdo, Korzog, Tsokar and Debring; three Oildrum Incinerators were given to the villages. At present, there is no waste collection in the area, nor dumping sites in all villages opened. The waste is flying around, some dumped in the wild or near rivers or seashore. Separation for Recycling of plastics, glass and metal is almost unknown! Tourism is growing, more hotels, tented camps, guesthouses, home-stays and restaurants are set up, especially in Korzok and Tsokar. Most of the tented camps have made holes for the waste, regular burning of the unsorted waste is practiced, a smelling, health hazardous affair. The Awareness that burning all waste, especially all plastics is so far not known. Wildlife Dept. has already lead cleaning campaigns; this unsorted waste, already filled in sacks remained there, as no transport to Leh could so far organized by Wildlife Dept. In Puga Residential Nomad School live around 85 students and 10 teachers. 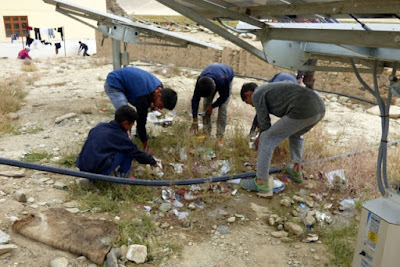 A Cleaning Campaign was organized, followed by waste separation by students and teachers. The parts for Recycling and Dumping were set aside, a demonstration of Burning in the incinerator with paper and plastic wrappers was In lower Sumdo a Cleaning Campaign was organized by around 30 villagers, followed by a waste Separation for Recycling, Dumping and a demonstration of Burning. In upper Sumdo 25 villagers took part in the same action. In Korzok with around 300 people living, the villagers deposit their garbage in some dump sites or oil drums, located in- and outside the village. Usually waste is burned, even metal and glass with the help of kerosene, as well by some of the camps. The Village does not look clean. No waste collection, nor dustbins have been introduced so far. A meeting of villagers and YDA discussed the cleaning problem. A demonstration of waste Separation for the village groups, even monks and military, was organized. Almost 50 people separated the waste. The parts for Recycling and Dumping were set aside, a demonstration of burning in the incinerator with paper and plastic wrappers was given. In a separate discussion, a site for collection of recycling waste and proper dumping was identified. Our visit to the lakeshore showed a lot of plastics, cement rests, even rotten player flags in and near the water. In Thukjey at Tsokar-Lake two tented camps, guesthouses, home-stays and restaurants have been set up, most tourist visit here after Tso Moriri. The Eco Resort had already started a simple waste separation in earthholes. Dumping of waste outside village is practiced. On the day of our visit a Cleaning Campaign was underway. 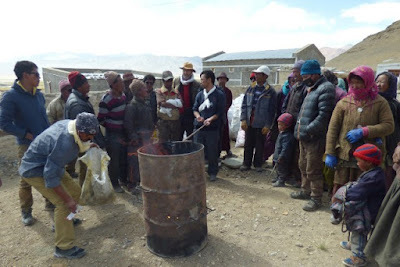 A demonstration of waste separation for Recycling and Dumping was given to 40 villagers, followed by a demonstration of burning. During our visit, a site for collection of recycling waste and proper dumping was identified. In Debring at the Manali Rd, a waste Separation for Recycling and Dumping was introduced to the shopkeepers. 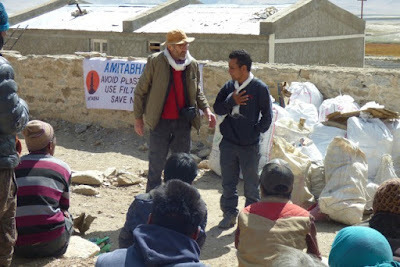 Recommendations: -introduction of deep hole as dumping site and regular waste separation for recycling of metal and plastics, especially in tourist locations will reduce waste by half -introduction of dustbins, may be three in different colours will assist the waste separation and to keep the village clean -follow up of waste separation practice and transport from villages to leh scrapdealers will assist in spreading the practice of waste separation. Sustainable project work, wherever there are projects, requires constant commitment. Not only internally are problems to be managed, but also external. Internally, market shifts as a result of political weather conditions can be detrimental, - interpersonal relationship and family structures change. Externally, e.g. In connection with political processes between urban and rural, even affects of foreign co-operations, can be more than a hindrance. In the long-term, work in the area of the arts and crafts, of course, also changes the relationship between producers and consumers, - this is the case in the growth-oriented manufacturing of handicrafts on the one hand and the individual production of unique items on the other hand. The team of Dr Siller, from central Europe, has spent time in researching the recycling of products, their design improvements for value addition, as well as decycling, which means the use of high-quality material accessories. These type of project inputs are better pushed in Central Europe because of the need for substantial research. The Siller team has been doing research on the material of fish leather in Germany, Austria, Iceland, - probably research on the Ussuri will be necessary, - preparatory work has already been undertaken in a project on the Amazon. The fish leader project is a good example of handicrafts for NGOs in the rural areas and can stimulate and inspire local work. This is true for the mother project in Pakistan, as well as for daughter projects in Cameroon and Colombia.